Tweet about your business and add a comment about you on our Facebook page the week you join. All of this happens within a few days of joining the Chamber. The value of this marketing is immeasurable. All of this marketing and publicity is included for the very reasonable price of a Chamber Membership. And if that is not enough…. We offer many levels of paid sponsorship opportunities on our website and at each of our Chamber events for even greater visibility. By joining the Chamber you will be identified as a member of one of the most trusted business organizations on the local, state, and national level. We will help promote your business while your membership dollars help fund the good things the Chamber does within the community like providing free learning opportunities for business owners and their employees, partnering with the local schools on career day events and other business related activities, adding culture to our community through the sponsorship of the Henry County Concert Series, revitalizing our downtown through participation in the Indiana Main Street program; these are just a few. Your company needs to be a part of the Chamber of Commerce! Your investment in the Chamber may be deductible as a necessary business expense. Please check with your accountant. When asked to supply names of businesses in our area, our staff policy is to offer those businesses and organizations that are members of the Chamber. Additionally, all Chamber business is conducted with Chamber members whenever possible. Volunteering for Chamber committees gives you the opportunity to study community needs in-depth and find solutions to concerns of the business community. This is your chance to help shape the future of Henry County! The Chamber is a well organized, strong advocate for the business community affecting public policy decisions to the benefit of the business community and the well being of Henry County. The Chamber’s bulk rate postal permit is available to members for mailings of 200+ pieces. This offers a considerable savings with reduced postage rates and eliminates the $175 annual permit fee. Several Chamber member insurance companies offer general and health insurance packages to members only, often at reduced rates. Make new contacts and create opportunities to expand your business by meeting new potential customers through Chamber events, committee involvement, ribbon cuttings, publications and mailings. Business members receive a window decal identifying you as an active member of Henry County’s most active and progressive business organization. New members and their businesses are introduced at Chamber events and in the weekly E-blast and Chamber Talk Courier Times insert. Listing in this annual publication is a vital part of your membership package. Each year, thousands of our directories are distributed to potential customers and community members. Your business will automatically be listed on our website in our Business Directory. Your business cards and promotional materials may be displayed in our Chamber lobby. Published twice a year, Chamber Magazine highlights the many positive qualities, businesses, and people of Henry County. 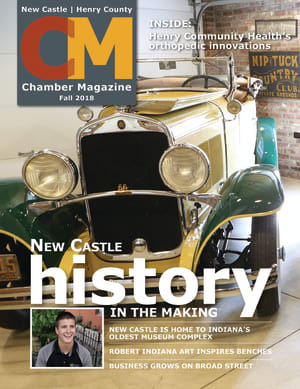 Only Chamber members may advertise in the high quality glossy publication.